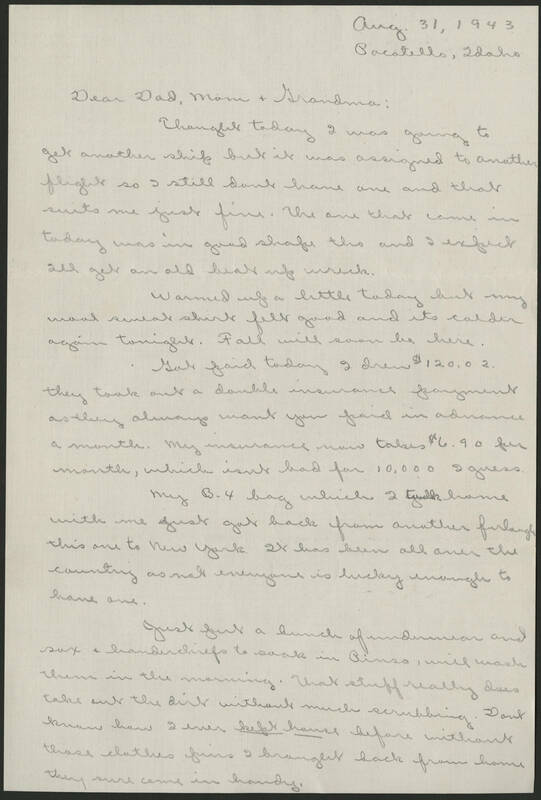 Aug. 31, 1943 Pocatello, Idaho Dear Dad, Mom, + Grandma: Thought today I was going to get another ship but it was assigned to another flight so I still don't have one and that suits me just fine. The one that came in today was in good shape tho and I expect I'll get an old beat up wreck. Warmed up a little today but my wool [sweat?] shirt felt good and its colder again tonight. Fall will soon be here. Got paid today I drew $120.02. They took out a double insurance payment as they always want you paid in advance a month. My insurance now takes $6.90 per month, which isn't bad for 10,000 I guess. My B-4 bag which I took home with me just got back from another furlough this one to New York. It has been all over the country as not everyone is lucky enough to have one. Just put a bunch of underwear and sox + handerchiefs to soak in [Pinso? ], will wash them in the morning. That stuff really does take out the dirt without much scrubbing. Don't know how I ever kept house before without those clothes pins I brought back from home they sure come in handy.